If you are a homeowner in Little Falls, NJ and you are looking for an expert HVAC company to service all your air conditioning and heating needs – Bloomfield Cooling, Heating and Electric, Inc., is able to provide you with top level customer service with knowledgeable “certified” technicians who will get the job done right. Bloomfield Cooling, Heating and Electric Inc. has been a highly regarded HVAC contractor in your area for over 27 years. We service most brands of air conditioning systems including the very popular Mitsubishi ductless air cooling systems. If your home does not have a central air conditioning unit, we are a full service company providing new installations, repairs and maintenance. We service the northern New Jersey area, including all of Passaic County and the surrounding communities. Bloomfield Cooling, Heating and Electric, Inc. is a family owned and operated business. We carefully hire our own staff of certified technicians and licensed electricians. We are also fully insured. We take pride in knowing that our staff has longevity with us. They have not only been trained to work on air conditioning systems, but they have been trained on how to provide excellent customer service. Our ongoing special offers are available to your community right now: Take $500.00 off the complete installation of a new air conditioning system. Or, for those who already have a system but need maintenance, take advantage of our air conditioning tune up package for $ 89.99 (a regularly priced $ 149.99 service ). Keeping your air conditioning system in good condition with regular maintenance will increase the life of your system and keep it operating at peak performance. Our professional customer service representatives take great pride in what they do and they are happy to assist you with scheduling a free on-site evaluation of your home. 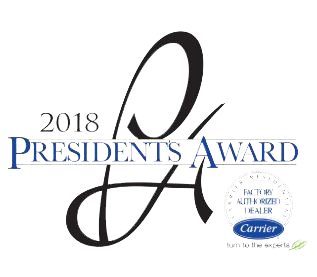 We have recently been recognized by Carrier and we were awarded the “President’s Award”. We have also been recognized and endorsed by Angie’s List for the past 10 years with their highest honor “the Superior Customer Service Award” and we have been awarded the “Reader’s Choice Gold Award” by the subscribers of the Suburban Essex Magazine as BEST HVAC Contractor for two years in a row. You will be impressed with our white glove service and our knowledge of the products we sell and service. We invite you to give us a call, invite us into your home and see the difference.